Dance party in Hanoi, inspired by Cape Towners! Look what arrived today! The kids were so excited to see the rhythmic paintings from South Africa! We have them all displayed proudly in our classroom! 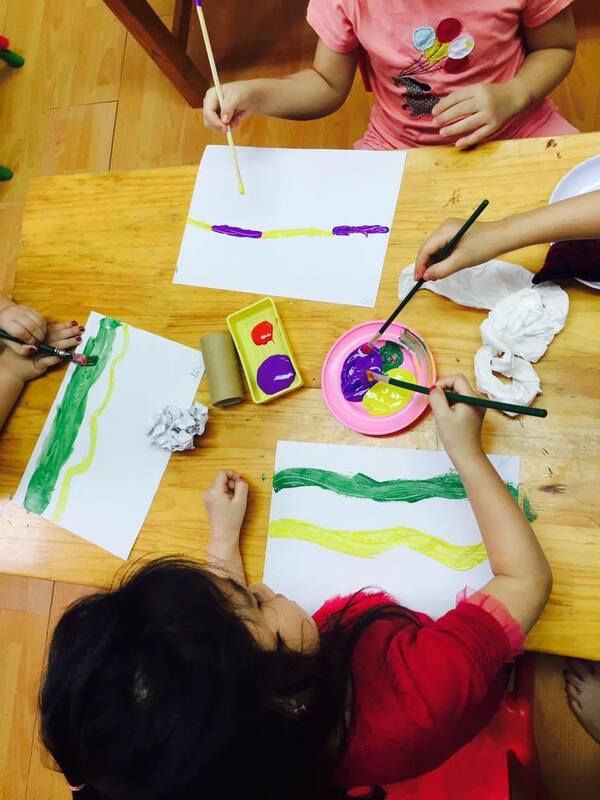 The 4 year old Puppies from Just Kids in Hanoi, Vietnam are making and sharing art with the 3-6 year olds at Oakdale Montessori School in Cape Town, South Africa. Patterns received in Cape Town! 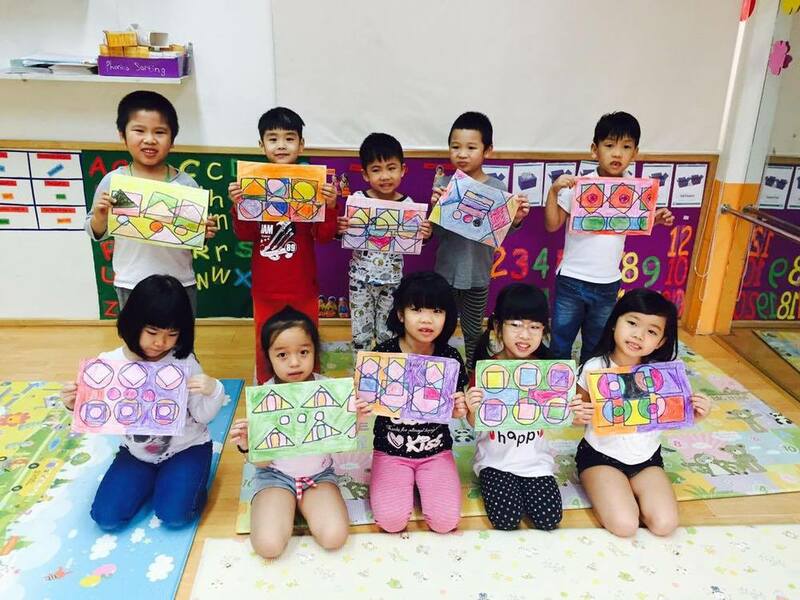 Everybody at Oakdale Montessori School in Cape Town, South Africa look so happy to have received their handmade patterns from Tigers from Just Kids School in Hanoi, Vietnam! Lamees, the teacher in the classroom introduced the project during circle time while discussing the weather. We stopped and heard a bit of wind. 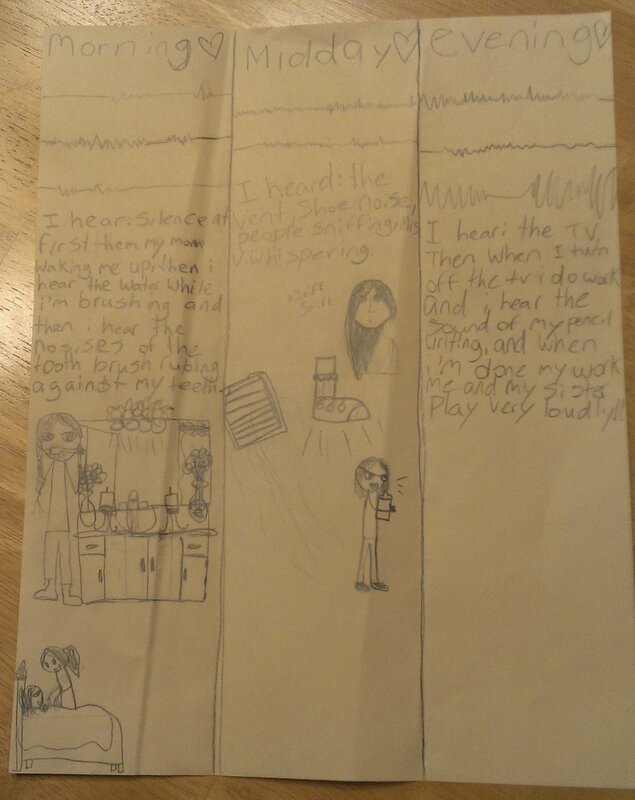 I asked if they could hear it. We described it as the wind was crashing against the classroom. I told the children instead of using paint brushes, what else can they find in the garden and the first thing they went to was the trees. The colors of the week are green and yellow so we kept in with our theme. brought back pegs, sticks, leaves, twigs from around the school property and instead of using normal powder paint they decided to use food colouring. 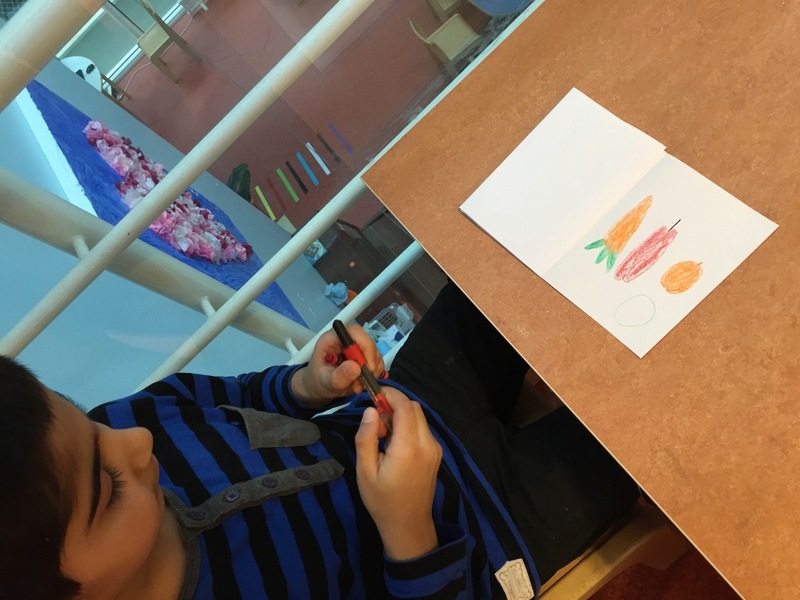 The children loved the new and different way of painting and had a ball with the different leaves and colors. 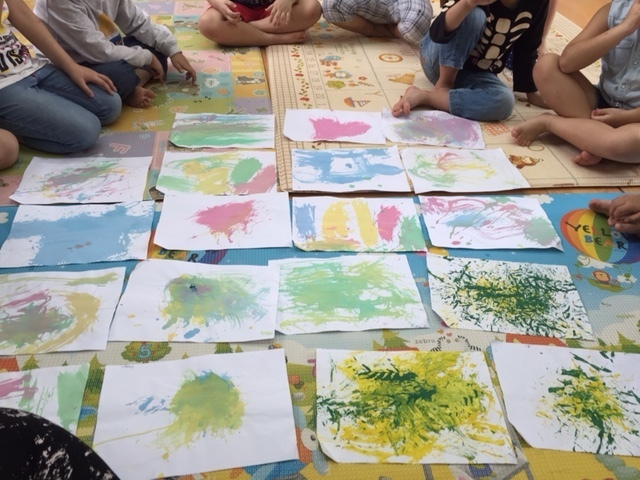 My Toddler Class this morning decided that they also wanted to be included in the latest art project, so we let them experiment. 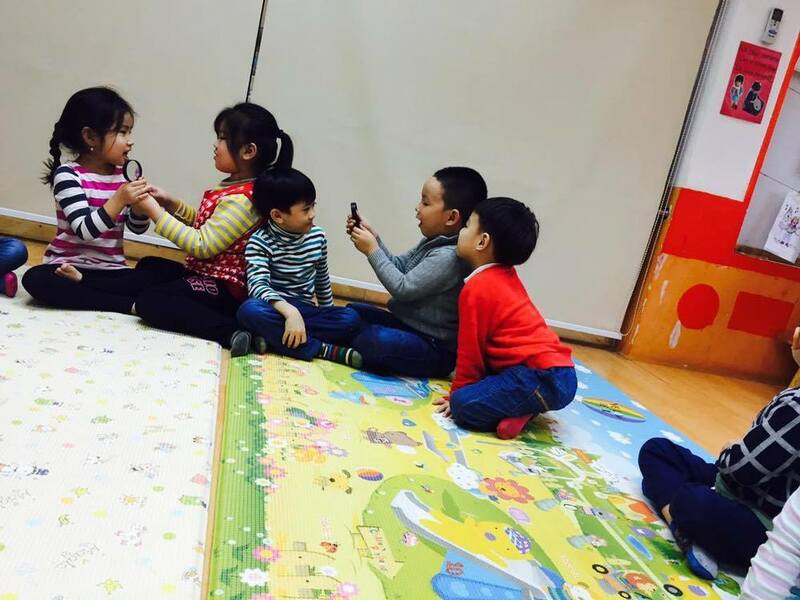 The children in the Toddler class range in age from 19 months to 3 years of age. WOW! What a great art project! The children absolutely loved this project and they produced some wonderful pieces that showed their thoughts and feelings from the music. We started off this project by closing our eyes and listening to some music. I chose Simply Three's instrumental version of Avicii's Wake me up. I chose this song because it has some clear layers of music that will attract different students. I also chose an instrumental song because English lyrics might be too difficult for us at this stage. After listening to the song once, i replayed it and we broke down all the different parts of the song. The beats, the high pitched violin and the deep base sounds and we started to draw on the whiteboard what we think those sounds looked like. A very popular response was spotting on the board to the beat, and doing swirls and waves to the melody. What about the colour? What colour does it sound like? Blue? Green? Red?? Now it was our turn to paint! We had a range of medium to paint with. We had paintbrushes-thick and thin, chop sticks, cardboard toilet rolls, scrunched up paper and tissue. Then the music started again and we were ready to go. The children were so eager, some starting with their spotty beats and others making rainbow waves. 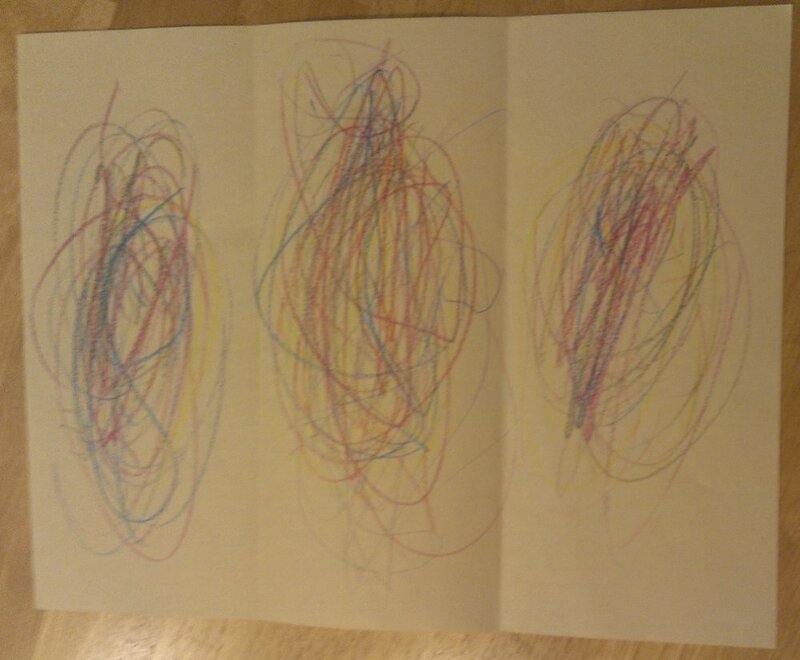 We had circles, we had lines, we had swirls and we even had some happy faces. We played the music a number of times until all the children had finished their painting. Some even did 2 or 3 paintings, which are now proudly displayed in our classroom. What a wonderful art project that the children really enjoyed. Love as always to our friends in South Africa and Finland! Below are photographs from the workshop with the Tiger Cubs. The Tigers are pattern happy! Thank you Puppies! 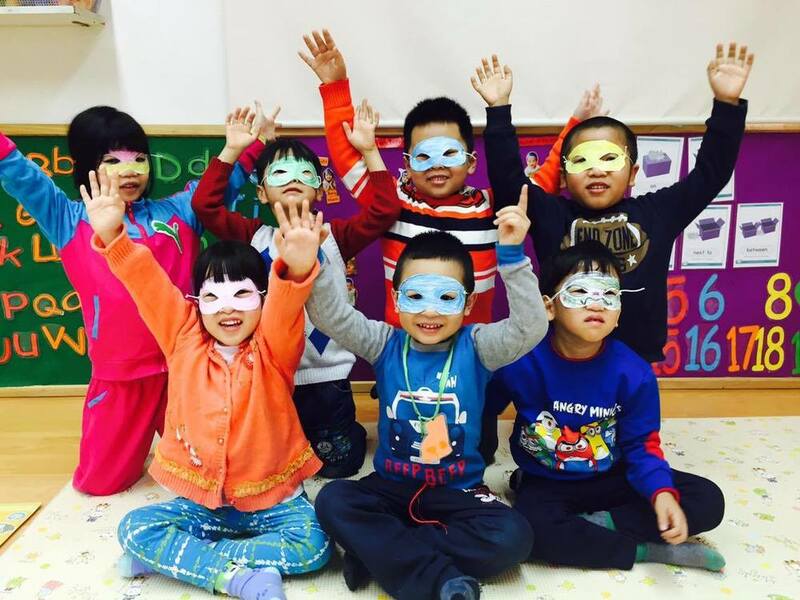 We OBVIOUSLY love our pattern masks you made us! What a fitting project for our little learners! We are currently learning all about food in our classroom. 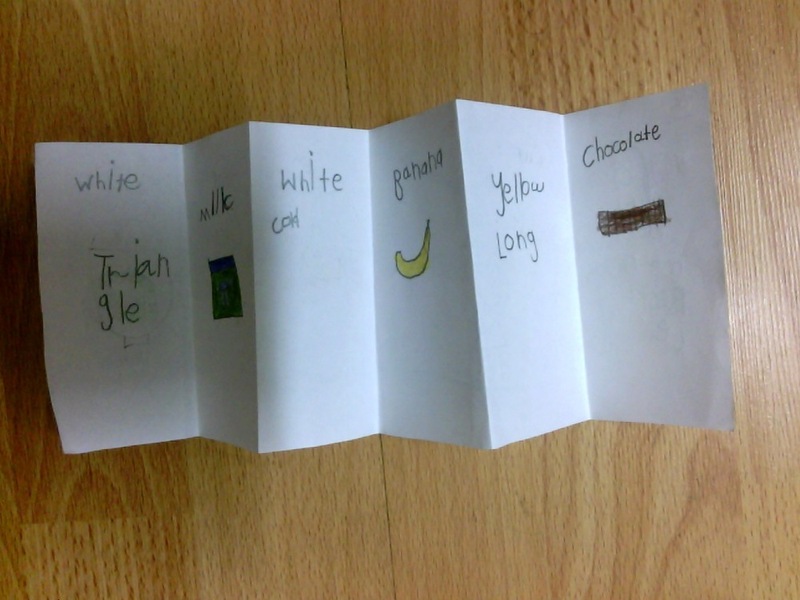 The kids loved making these little books, we had more fun talking about our favourite foods! We haven't learned too much about tastes but we do know lots about colours and shapes! Some of us say pasta is a circle, because of the plate, some see the long pieces of pasta! What colour is bread? what shape is a salad?? Different perspectives come from different minds. 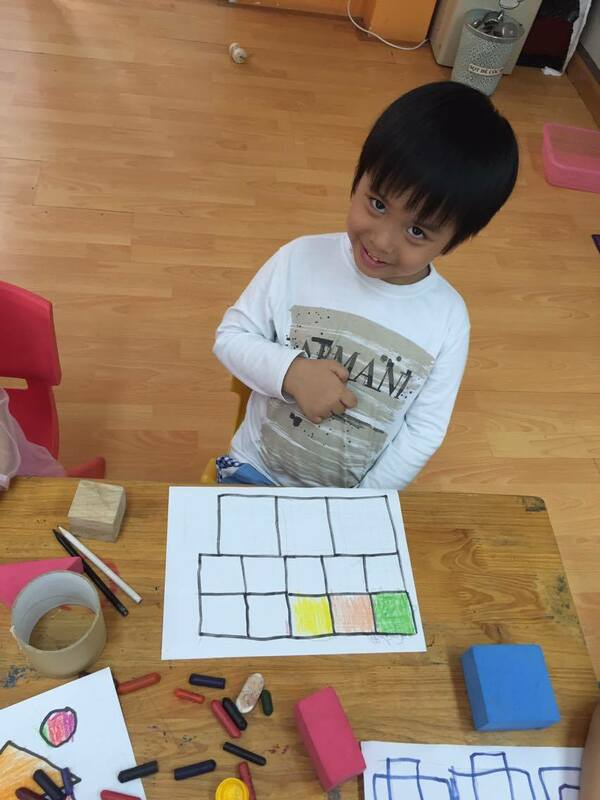 We even turned it into a guessing game, guessing what something long and yellow is... or something red, yellow and a triangle shape....What fun! 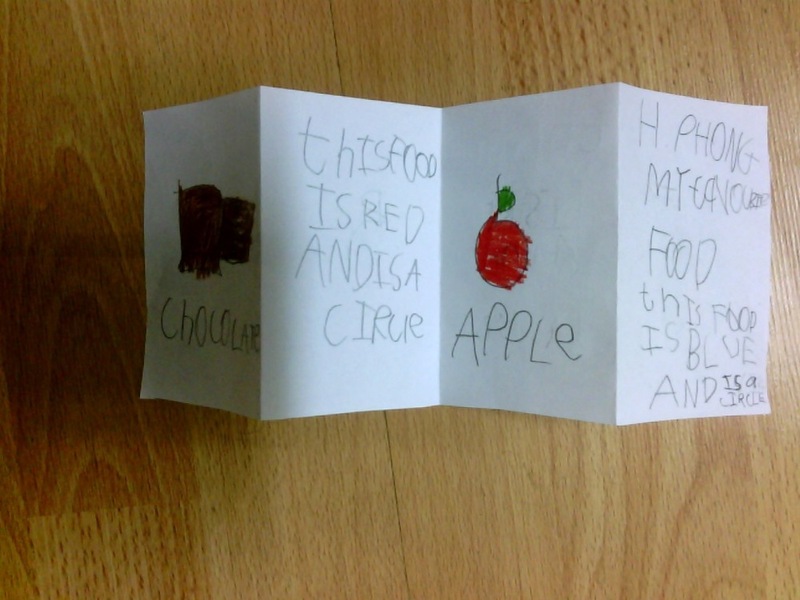 We are also starting to write, we learned lots about writing shapes, colours and the names of our favourite foods. We hope that our friends in Finland and South Africa enjoy our game and we look forward to learning what your favourite foods are! 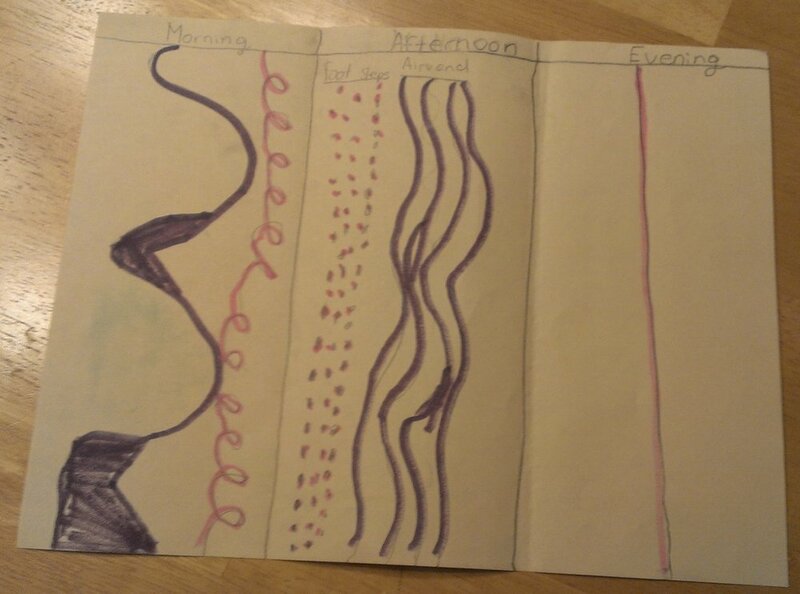 Below are artworks from the Tigers Cubs. Below are artworks from Puppies. 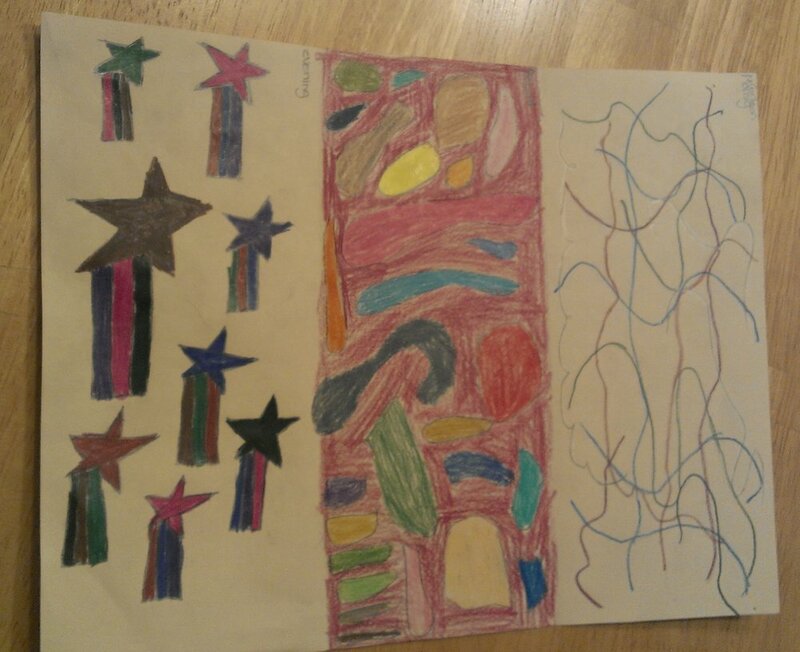 Patterns to South Africa and Finland from Vietnam! WOW! What an interesting project, we learned so much about ourselves and the world around us! We started by looking around our classroom and noticing some repeated patterns around us. Particularly during the winter months, we can experiment with some interesting and wonderful patterns on our clothes. Then we decided to go a little deeper, and we got some magnifying glasses and started looking at our skin. The wrinkles, the lines, the hairs. How interesting we are! What about our friends, what do their faces look like?? What happens when we pull funny faces?? when we raise our eyebrows?? Remembering what we saw, we got straight onto making our masks. we remembered the lines, the spots, the hairs and we made our masks with the patterns from our skin. But of course we had to add some colour! I hope our friends in Finland and our new friends in South Africa enjoy our masks! What?! How can that be? Where did that come from? Things started to look very different when put under the lens. 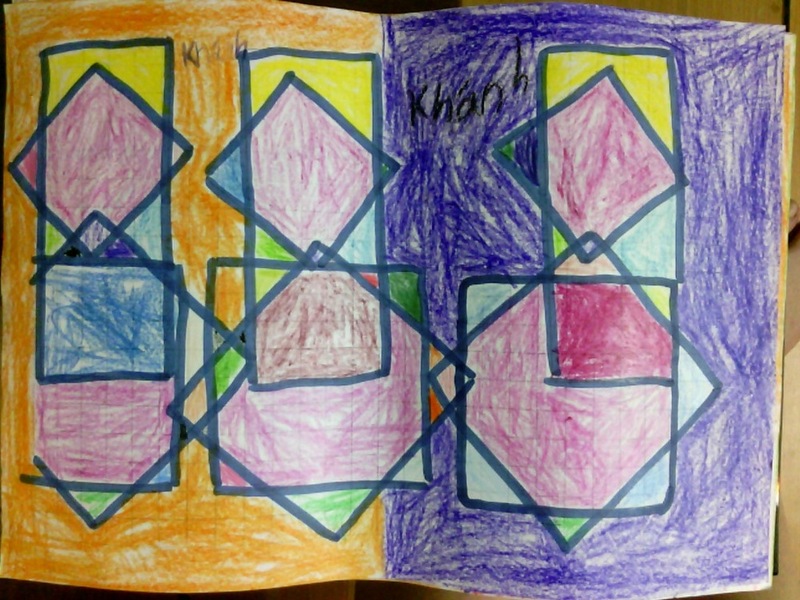 The Tigers were explorers and made art inspired from their explorations. The world may look different after some close inspection : ). Yay! 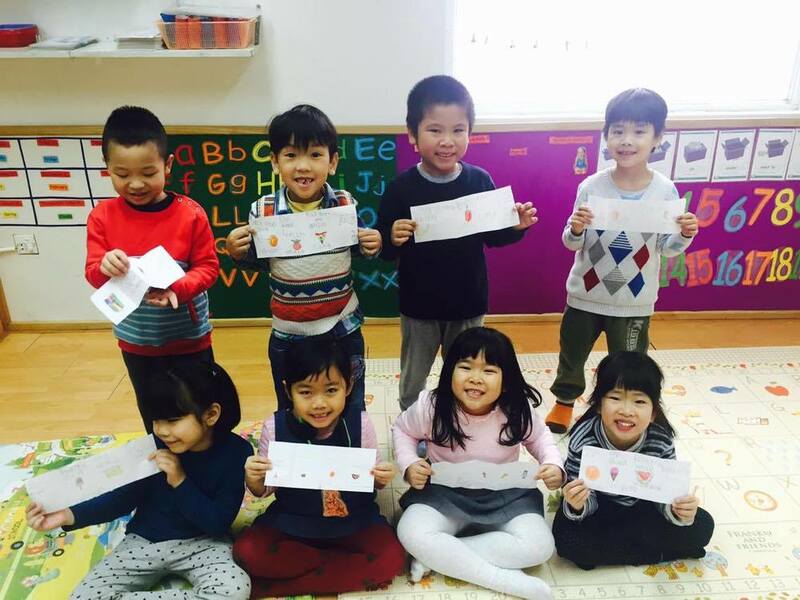 The Tiger Cubs and Puppies received a package from Finland! Look what came today! The kids were very excited to check it all out! And were very intrigued with their inventions! Will they walk? or..drive?... or fly?! 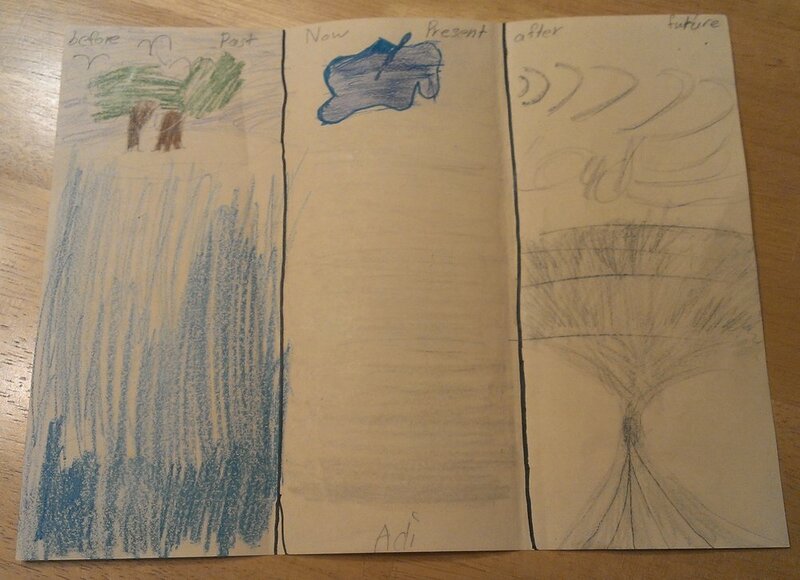 The kids, as usual were very eager to start creating their next project. We remembered the amazing things we have made already. 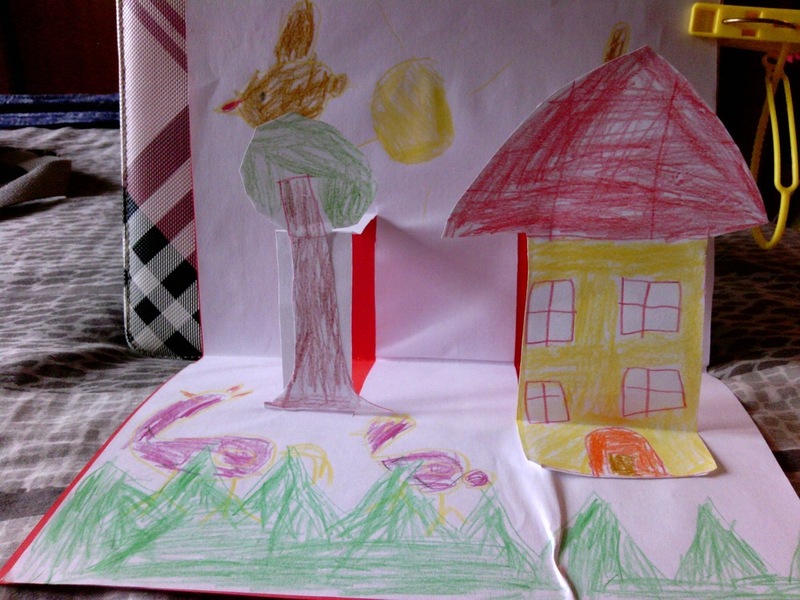 First we made a friend, then we had to make a house for that friend, then we needed a place for the house... now, how will our friend get around? 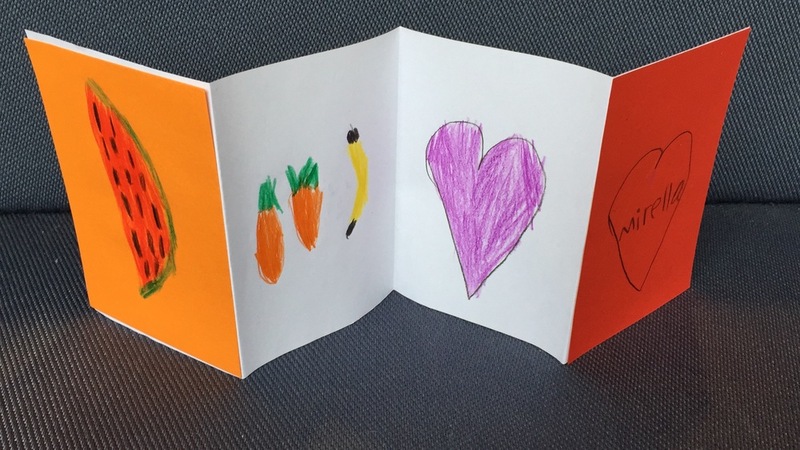 I asked the children, so, what makes our things special? whats crazy or different about your train? "my train is a High speed train!" "my boat has candy inside!" "my plane is also a bird!" 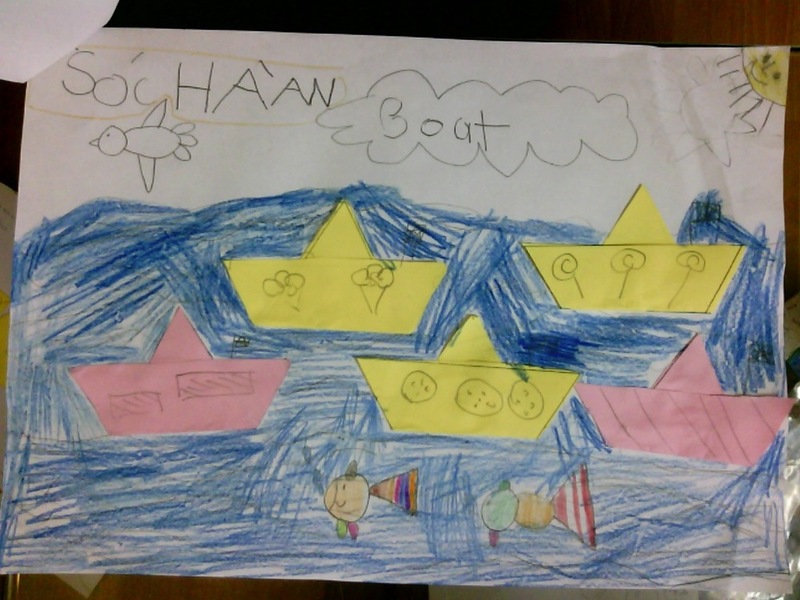 "my boat is going to my grandma and grandpa's house!" So many imaginative ideas, we all had a great time playing with shapes and using our creativity. Dear friends of Finland, we hope you enjoy our art! The kids were so excited to begin our second art project for our new friends in Finland! We started by discussing our imaginary friend puppets that we made... and they were so so lovely...but there was one small problem. Where were they to live when they arrived in Finland?? Oh dear! We better get onto this straight away! 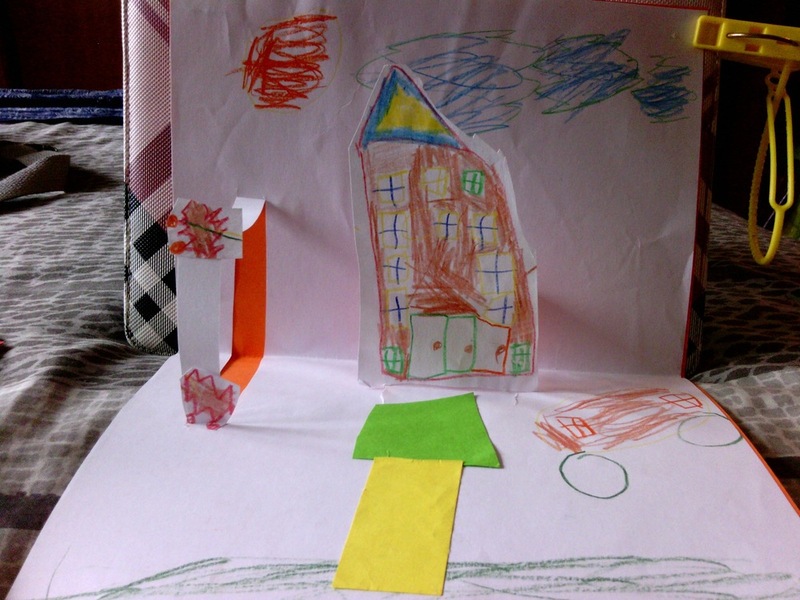 So we had a small discussion about what our friends house might look like and where they might live.. Little Ong said her imaginary friend lives in Finland, we had friends living in tall buildings, in cars, in airplanes and even underwater! 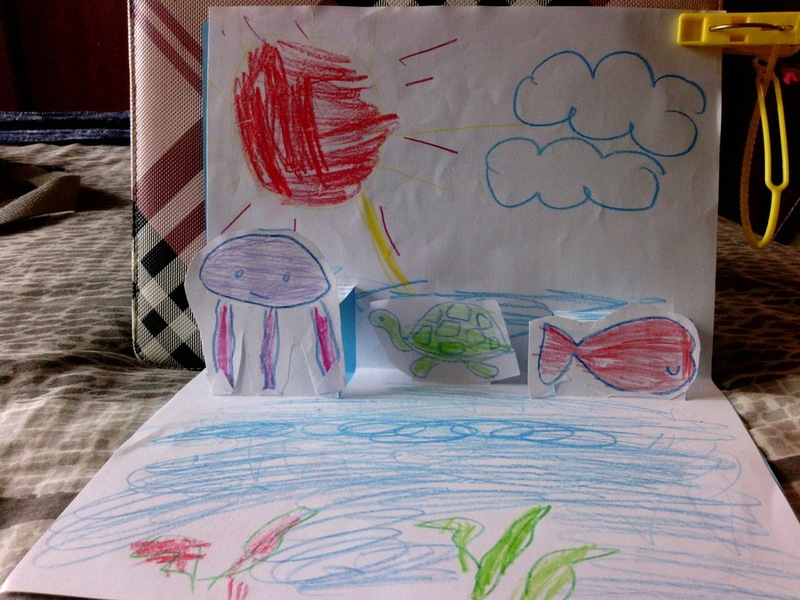 Phuong Linh remembered her Mermaid friend, who of course, lives in a palace under the sea! I showed them all a demonstration that I had made, they were all so excited that they were soon to be making their own! Then we went step by step over the project. Talking about tall buildings need bigger cuts up the paper, but small things only need a small cut. Soon enough we were at our tables, and imaginations and creativity were flowing! 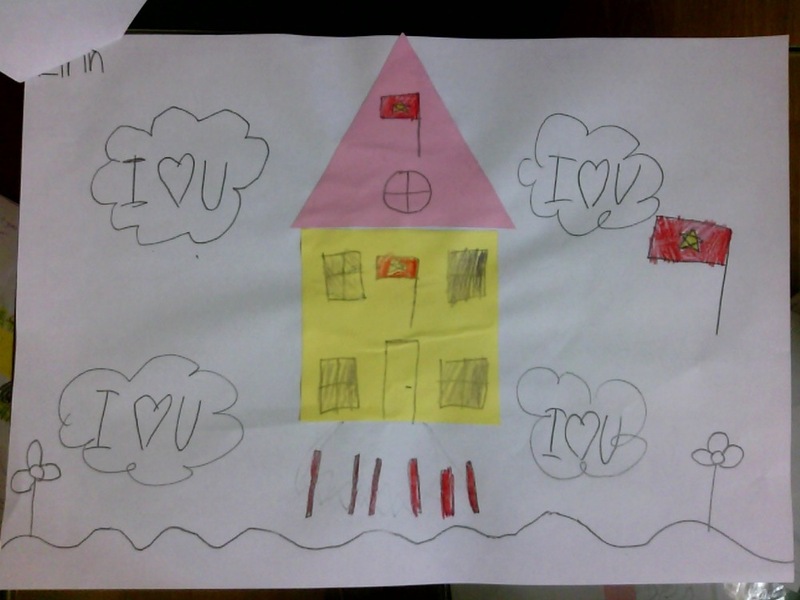 we had tall buildings, houses, fish, minions, hearts, trees and more! They were so proud of their creations that they carried them around the classroom while they tidied up! We are sure our friends in Finland are going to love them! 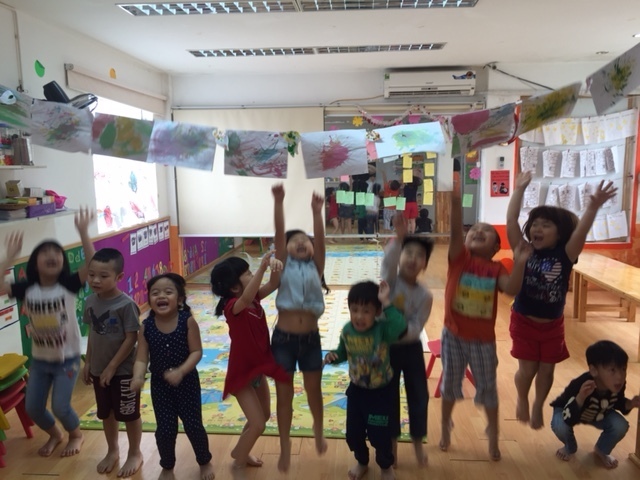 With love, Teacher Steph, the Tiger Cubs and the Puppies from Ha Noi, Vietnam. 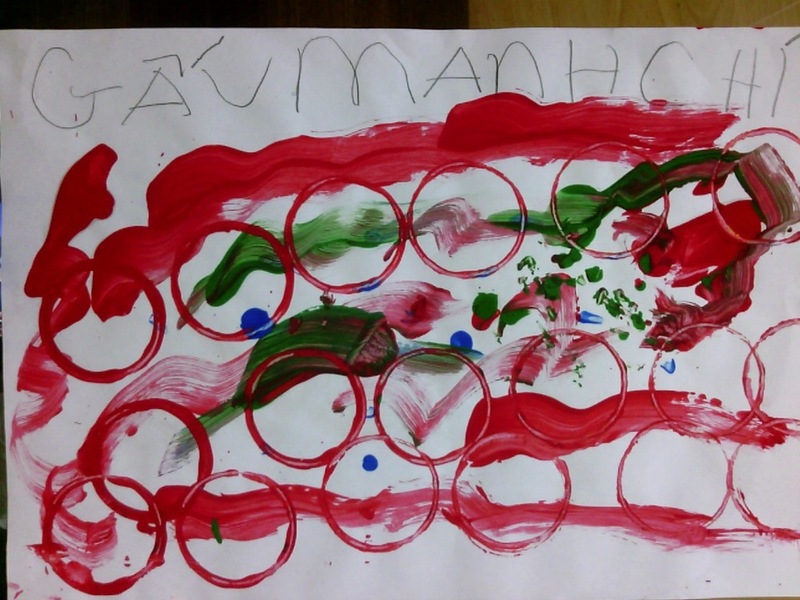 Here are some artworks of the Tiger Cubs to K1 artists in Helsinki, Finland. Here are some artworks of the Puppies to the Tigers in Espoo, Finland.